This category is for solutions targeted for schools and respond to the needs of different national curricula and school systems. This category is for solutions that teach languages to young children through digital games and playful activities. The pedagogy of online-tutoring services is evaluated based on the quality of the material and structure they provide to their tutors. The solutions will be assessed with science-based impact evaluation method and benchmarked against each other with respect to their pedagogy, curriculum alignment, and usability. As every participating product goes through a rigorous learning impact evaluation, the Finnish Educational Quality Certificate is issued to all products that meet the science-based standard. 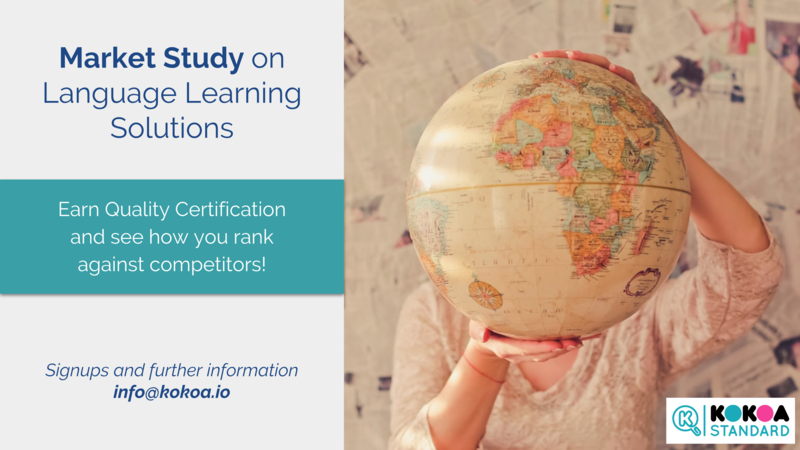 Participation in the study offers a trustworthy and agile way for getting the evidence of your product’s learning impact and seeing how it ranks against its competitors. The application period is open until the 1st of May. If you're interested in enrolling your product or would like to know more, contact us at info@kokoa.io or call +358407576961.